GNOME 3.10 has been released yesterday and I've received requests to write an article on how to upgrade to it in Ubuntu 13.10 Saucy Salamander, so here goes. The instructions below are only for those who want to use GNOME Shell (Ubuntu GNOME users, Unity users who want to switch to GNOME Shell, etc.) because of some bugs with the GNOME 3.10 PPA packages and Unity. 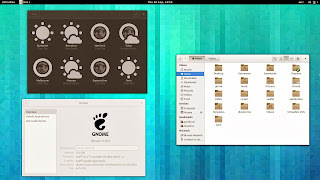 The GNOME 3 Next PPA, announced not so long ago, contains GNOME 3.10 packages that are considered stable. 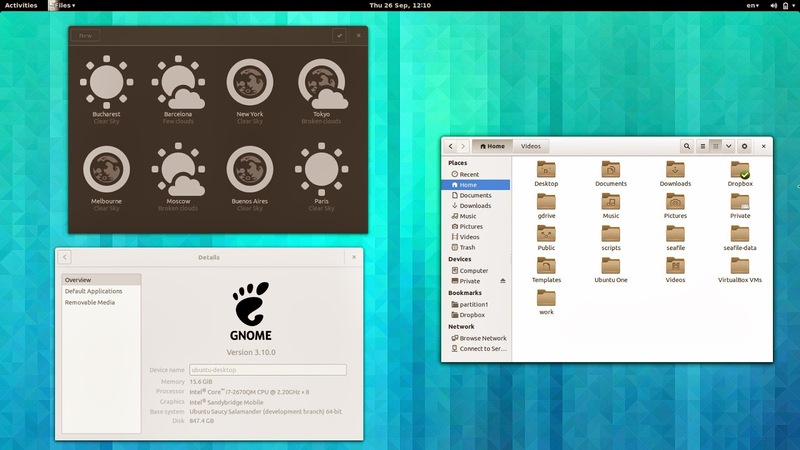 Unfortunately, the PPA currently only has a few packages: GNOME Shell (including the official extensions), GNOME Themes, GTK3, Mutter, Clutter, Network Manager, Vala, Wayland and WebkitGTK so basically, to get a GNOME 3.10 desktop which includes System Settings, the core apps, etc., you must also add the GNOME 3 Staging PPA which contains packages that have known bugs and regressions, "sometimes of critical nature" mentions the PPA description. some applications may not work properly or not work at all - in my test, Synapse stopped working while gThumb doesn't display the thumbnails properly. So only follow the instructions below if you know what you're doing and know how to use PPA-Purge to revert the changes in case something goes wrong! What will be upgraded: by using the instructions below, besides GNOME Shell (and the default extensions), GDM, GTK, GNOME Control Center, etc. and various libraries, the following applications will be upgraded to version 3.10.0: Cheese, Eye Of GNOME, Evince, Gedit, Boxes, Clocks, Contacts, Documents, Font Viewer, System Monitor, Terminal, Tweak Tool, Weather and Files (Nautilus). Web (Epiphany) won't be upgraded to version 3.10 for now, but to 3.9.91. What won't be upgraded to version 3.10: unfortunately, the other GNOME 3.10 applications are missing from these PPAs: Music, Notes (Bijben - version 3.8.4 is available in the official repositories), Maps, Photos and Software. Totem won't be upgraded for now either. That said, let's proceed to upgrading GNOME to the latest 3.10 version in Ubuntu 13.10 Saucy Salamander. 1. Switch to GDM if you're not using it already. And select GDM instead of LightDM when prompted. If you want to switch between LightDM, GDM, etc. see THESE instructions. Before adding the GNOME 3 Staging PPA, make sure you read its description. Important: when running "dist-upgrade", make sure you read the output before entering "y" to make sure no important packages are removed! And in the login screen, select the "GNOME" session. Ambiance doesn't work properly with applications that use client side decorations so if you were using it, change to Adwaita theme using GNOME Tweak Tool (the application should have been installed with the last command from step 2 above). Another theme that supports GNOME 3.10 and client side decorations is Numix. If you were using LightDM and want to switch back to it, follow THESE instructions.